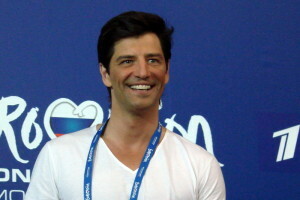 Sakis Rouvas was asked if he liked the entry from Bosnia and Herzegovina. Aside from thinking that Regina was a female singer he answered quite well when he turned it into being about what is good music and why he prefers a national with public voting over an internal selection. Sakis had some problems today where he fell during his first stage rehearsal and was he joking when he thought that the male band, Regina, representing Bosnia & Herzegovina, actually was a female singer? No matter what then he did handle it quite well when thought what he thinks of the song. Below you can see the video from the first Greek press conference where he turns the answer into being about what good music in general is, who can tell and why he prefers a national final with several songs and a public voting over an internal selection where singer and song is chosen by the broadcaster or a special committee.